Grand Est (French pronunciation: [ɡʁɑ̃t‿ɛst] ( listen); English: Great East, German: Großer Osten—both in the Alsatian and the Lorraine Franconian dialect), previously Alsace-Champagne-Ardenne-Lorraine (ACAL or less commonly, ALCA), is an administrative region in eastern France. It superseded three former administrative regions—Alsace, Champagne-Ardenne, and Lorraine—on 1 January 2016, as a result of territorial reform which was passed by the French legislature in 2014. 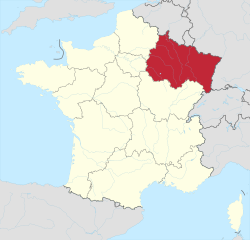 Alsace-Champagne-Ardenne-Lorraine was a provisional name, created by hyphenating the merged regions in alphabetical order; its regional council had to approve a new name for the region by 1 July 2016. France's Conseil d'État approved Grand Est as the new name of the region on 28 September 2016, effective 30 September 2016. The administrative capital and largest city is Strasbourg. The provisional name of the region was Alsace-Champagne-Ardenne-Lorraine, which is formed by combining the names of the three present regions—Alsace, Champagne-Ardenne, and Lorraine—in alphabetical order with hyphens. The formula for the provisional name of the region was established by the territorial reform law and applied to all but one of the provisional names for new regions. The ACAL regional council, which was elected in December 2015, was given the task of choosing a name for the region and submitting it to the Conseil d'État—France's highest authority for administrative law—by 1 July 2016 for approval. The provisional name of the region was retired on 30 September 2016, when the new name of the region, Grand Est, took effect. In Alsace and in Lorraine, the new region has frequently been called ALCA, for Alsace-Lorraine-Champagne-Ardennes, on the internet. Like the name Région Hauts-de-France (and, until 2015, the name Région Centre), the name Région Grand Est contains no reference whatsoever to the area's history or identity, but merely describes its geographical location within metropolitan France. In a poll conducted in November 2014 by France 3 in Champagne-Ardenne, Grand Est (29.16%) and Austrasie (22.65%) were the top two names among 25 candidates and 4,701 votes. Grand Est also topped a poll the following month conducted by L'Est Républicain, receiving 42% of 3,324 votes. Grand Est français [fr], a term used to refer to the northeast quarter of Metropolitan France, although this term refers to a geographic region larger than just ACAL. The term has been commonly used and topped the polls mentioned above. Grand Est Europe (Great East Europe), a variant of Grand Est that alludes to the region being a gateway to Europe both through trade and since Strasbourg is home to several European institutions (which makes it one of the three unofficial capitals of the European Union). However, the name was mocked for how it could suggest that the region is in Eastern Europe. Austrasie (Austrasia), which refers to an historical region spanning parts of present-day northeast France, the Benelux, and northwest Germany. Quatre frontières (Four Frontiers), which refers to the region's border with four countries. Grand Est covers 57,433 square kilometres (22,175 sq mi) of land and is the sixth-largest of the regions of France. Grand Est borders four countries—Belgium (Wallonia region), Luxembourg (Cantons of Esch-sur-Alzette and Remich), Germany, and Switzerland—along its northern and eastern sides. It is the only French region to border more than two countries. To the west and south, it borders the French regions Hauts-de-France, Île-de-France, and Bourgogne-Franche-Comté. Map of the new region with its ten départements, colored according to the historical provinces as they existed until 1790. Grand Est contains ten departments: Ardennes, Aube, Bas-Rhin, Marne, Haute-Marne, Haut-Rhin, Meurthe-et-Moselle, Meuse, Moselle, Vosges. The main ranges in the region include the Vosges to the east and the Ardennes to the north. The region is bordered on the east by the Rhine, which forms about half of the border with Germany. Other major rivers which flow through the region include the Meuse, Moselle, Marne, and Saône. Lakes in the region include lac de Gérardmer, lac de Longemer, lac de Retournemer, lac des Corbeaux, Lac de Bouzey, lac de Madine, étang du Stock and lac de Pierre-Percée. Grand Est climate depends of the proximity of the sea. In Champagne and Western Lorraine, the climate is oceanic, with mild winters and mild summers. But Moselle and Alsace climates are humid continental, characterized by cold winters with frequent days below the freezing point, and hot summers, with many days with temperatures up to 32°C. Grand Est is the result of territorial reform legislation passed in 2014 by the French Parliament to reduce the number of regions in Metropolitan France—the part of France in continental Europe—from 22 to 13. ACAL is the merger of three regions: Alsace, Champagne-Ardenne, and Lorraine. The merger has been, and still is, strongly opposed by some groups in Alsace, and a large majority of Alsatians. The territorial reform law allows new regions to choose the seat of the regional councils, but specifically made Strasbourg the seat of the Grand Est regional council—a move to appease the region's politicians. The region has an official population of 5,555,186 (municipal population on 1 January 2016). The regional council has limited administrative authority, mostly concerning the promotion of the region's economy and financing educational and cultural activities. The regional council has no legislative authority. The seat of the regional council will be Strasbourg. The regional council, elected in December 2015, is controlled by The Republicans. The elected inaugural president of the Grand Est Regional Council is Philippe Richert, who was previously the President of the Alsace Regional Council. The current president is Jean Rottner. Grand Est is rich with architectural monuments from the Roman Empire to the early 21st century. Gothic architecture is particularly conspicuous, with many famous cathedrals, basilicas and churches, such as Reims Cathedral, Strasbourg Cathedral, Metz Cathedral, Troyes Cathedral, Châlons Cathedral, Toul Cathedral, the Basilica of L'Épine, the Basilica of Saint-Nicolas-de-Port, the Basillica of Avioth [fr], the Basilica of St. Urbain in Troyes, Thann Church, Niederhaslach Church, Notre-Dame-en-Vaux, St. George's Church, Sélestat and St. Peter and St. Paul's Church, Wissembourg. ^ a b "Populations légales 2016". insee.fr. Retrieved 7 January 2019. ^ ""Grand Est": les élus valident le nom de région". Le Figaro (in French). Retrieved 29 April 2016. ^ Dupuis-Remond, Dupuis-Remond (18 December 2014). "Débat d'orientation budgétaire : la Grande Région ALCA dans tous les esprits – France 3 Lorraine". France 3 (in French). Retrieved 13 January 2015. ^ "La carte à 13 régions définitivement adoptée". Le Monde (in French). Agence France-Presse. 17 December 2014. Retrieved 13 January 2015. ^ "Cette région que l'Alsace ne veut pas baptiser". 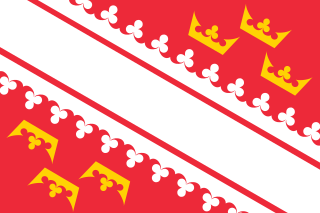 Dernières Nouvelles d'Alsace (in French). 7 December 2014. Retrieved 25 August 2015. ^ a b c "Votez pour le nom de la future grande région Champagne-Ardenne – Lorraine – Alsace". France 3 Champagne-Ardenne (in French). France Télévisions. 24 November 2014. Retrieved 25 August 2015. ^ a b "Choisissez un nom pour la Grande Région". L'Est Républicain (in French). 2 December 2014. Retrieved 25 August 2015. ^ Bach, Christian (21 June 2015). "Région Alsace-Lorraine-Champagne-Ardenne : le nom de la chose..." Derniers nouvelles d'Alsace (in French). Retrieved 25 August 2015. ^ Baldit, Etienne (21 July 2015). "Philippot refuse le nom 'Grand Est Europe' pour sa région : "Et pourquoi pas 'Roumanie' ?"". Europe 1 (in French). Retrieved 25 August 2015. ^ "La carte à 13 régions définitivement adoptée". Le Monde (in French). 17 December 2014. Retrieved 27 October 2015. ^ "Le malaise Alsacien ne décroit pas". L'Alsace (in French). 21 February 2018. Retrieved 21 February 2018. ^ "Grand Est: Philippe Richert, le "fossoyeur" de l'Alsace, démissionne". L'Express (in French). 30 September 2017. Retrieved 27 November 2017. ^ a b "Alsace – Champagne-Ardenne – Lorraine: Nouveau Conseil Régional". Elections régionales et des assemblées de Corse, Guyane et Martinique 2015. Ministre de l’Intérieur. Retrieved 14 December 2015. Wikivoyage has a travel guide for Grand-Est. Marne is a department in north-eastern France named after the river Marne which flows through the department. The prefecture (capital) of Marne is Châlons-en-Champagne. The subprefectures are Épernay, Reims, and Vitry-le-François. Châlons-en-Champagne is a city in the Grand Est region of France. It is the capital of the department of Marne, despite being only a quarter the size of the city of Reims. The Alsace Regional Council was the Conseil régional of Alsace (France) from 1982 to 2015. As a result of reforms, the administrative région Alsace merged with two other régions to form Grand Est, effective 1 January 2016, at which point the regional councils of Alsace, Lorraine, and Champagne-Ardenne were superseded by the Regional council of Grand Est. 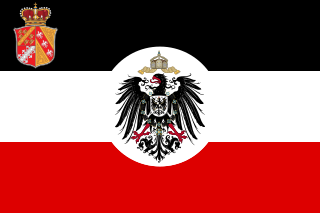 November 1918 was the period of transition when the region of Alsace-Lorraine passed from German to French sovereignty at the end of World War I. During this month, international events were linked to domestic troubles, particularly the German Revolution. TER Champagne Ardenne was the regional rail network serving Champagne-Ardenne région, France. In 2016 it was merged into the new TER Grand Est. The A26 is a 357.6 km (222.2 mi) long French motorway connecting Calais and Troyes. It is also known as the Autoroute des Anglais as it is the main route from the Dover-Calais ferries and the Channel Tunnel to Southern and Eastern France and the Cote d'Azur. The motorway is used by a high proportion of British cars, particularly during the summer holiday season. The A26 between Calais and Arras is one of the two main routes between London and Paris, the other being the A16. Champagne is a historical province in the northeast of France, now best known as the Champagne wine region for the sparkling white wine that bears its name. It was founded in 1065 near the city of Provins and was made up of different counties descended from the early medieval kingdom of Austrasia. The railway from Paris-Est to Strasbourg-Ville is a 493-kilometre long railway line that connects Paris to Strasbourg via Châlons-en-Champagne and Nancy, France. Officially, the line does not start at the Gare de l'Est in Paris: the first 9 km until Noisy-le-Sec is shared with the railway from Paris to Mulhouse. The railway was opened in several stages between 1849 and 1852. The opening of the LGV Est high speed line from Paris to Baudrecourt in Lorraine in 2007 has decreased the importance of the section Paris–Sarrebourg for passenger traffic. The railway from Paris-Est to Mulhouse-Ville is a 491-kilometre long railway line, that connects Paris to Mulhouse via Troyes, Chaumont and Belfort, France. The railway was opened in several stages between 1848 and 1858. The flag of Alsace is the original red and white flag of the region, and can be traced to the red and white banner of Gerard, Duke of Lorraine in the 11th century. 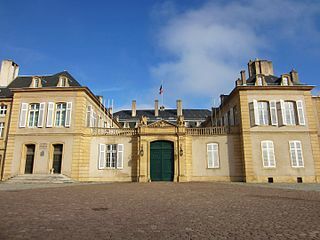 The regional council of Grand Est, formerly the regional council of Alsace-Champagne-Ardenne-Lorraine, is the deliberative assembly of the region of Grand Est. Jean Rottner of The Republicans (LR) is the current president of the regional council. He was elected on 20 October 2017, following the retirement of Philippe Richert on 30 September 2017.